Just to let you know that there are several ways to needle felt - I work with a single needle from the very center to the completion of the sculpture. So, when you ask what I start with as a base, my answer is, "100% wool !" However, the hours that it takes me to do the actual work with a single needle is not covered in the cost to you, the customer, to me needle felting is fun and each animal has it's own personality - you will never find two that are "twins". I simply use my clay units from my career as an Art teacher but I now have changed my media to wool - very simple! I have an assortment of cookie cutters that are made in the USA for sale. The cookie cutters may be used as templates for needle felting - excellent for pins, magnets & beginners! Go to the page under "more" w/Cookie Cutters! Call or email if you have questions - the inventory is always changing as the shows come & go! 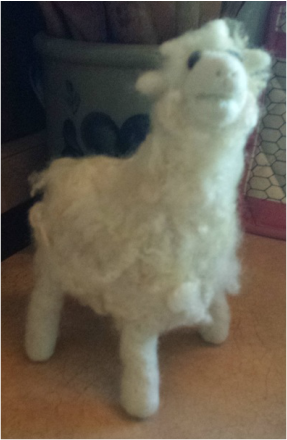 Needle felting is fun and I find it relaxing! is with Coopworth roving, some of my finishing texture is mohair and assorted dyed wool - but I do not use a base of foam or wire in my work, it is 100% wool! I am not finding fault with artist's that do use framework, it simply is not my style at this time. Who knows what tomorrow will bring in my fiber world? Felting kits are available for beginners, intermediate and I am willing to set up a class for you and your group - just contact me for information. 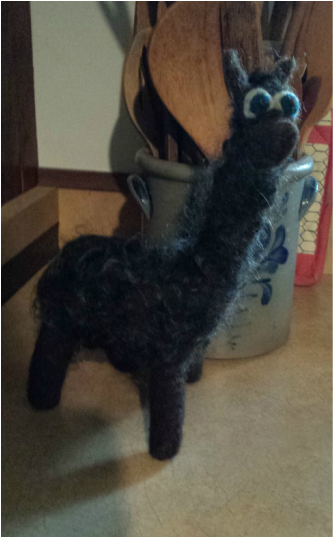 My work varies, the mood of the animals will usually determine the mood of the felted critter! Back view of "Pregnant Momma"
Felted Pins:This section will be updated following Rhinebeck - very busy now! Magnetic felted items will be updated following Rhinebeck, just too busy needle felting at this time! SEE YOU AT MARYLAND SHEEP & WOOL FESTIVAL, 1ST WEEKEND IN MAY, 2019 @ "EVERYTHING COOPWORTH"
Cookie Cutters work well as templates and also = success!